Stefan Hantel, aka Shantel, is a DJ and producer best known for his Balkan electro-pop project Bucovina Club. Max Dax spoke with the Frankfurt native in the Summer 2011 issue of Electronic Beats about his meticulously researched compilation of American Jewish mafia music, Kosher Nostra. There has always been a nebulous relationship between the representation of La Cosa Nostra in the American literary and cinematic traditions and its reality. The romanticism at the core of our image of organized crime is, in a sense, misleading. But it’s also undeniable that the history of the Mafia is nebulous in and of itself, because it’s a history of immigrant subcultures—strangers in a strange land trying to survive. Certainly, the Mafia is a brilliant backdrop for the explanation of the American Dream, and a subject matter that director Martin Scorsese has a deep understanding of. The historical beginnings of American gang activity is at the center of 2002’s Gangs of New York, while Scorsese’s other films, including Goodfellas, Mean Streets, Casino and The Departed, reverse the focus, observing organized crime in the context of specific moments in American history. In both instances however, finding accurate or even any sources on which to base his semi-historical narratives was supposedly not a simple undertaking. That said, fiction has often been integral to the construction of national myths and national identity, and this is where Scorsese’s strengths lie as a director. I would argue that our collective vision of La Cosa Nostra has, over time, been strongly influenced by Scorsese’s hyperreal narrative vision—both historical and imagined. Not that it’s always easy to tell the difference. With Boardwalk Empire, Scorsese has created a masterpiece together with former Sopranos writer and executive producer Terence Winter, whose knowledge of New Jersey and ability to surprise viewers with a contemporary take on “historical” events is nothing short of astonishing. This is the kind of historical Mafia storytelling I can relate to. When I was doing research for my project Kosher Nostra about the history and music of Jewish-American organized crime, I quickly found out how difficult it was to find information on the subject matter. Contemporary witnesses simply weren’t very willing to talk, and I really had to do some digging. To a certain extent, I was used to the research, as I had written my masters thesis on the Mafia. But now my intended result was an album, booklet and exhibit—not an academic work. What I was doing was not only historical but also, if not primarily, artistic and entertaining. I suppose that’s usually the case when it comes to tales of crime and intrigue. And that’s one of the reasons why I am so fascinated by Boardwalk Empire. The show’s vivid take on the twenties and thirties is almost vulgar in its hyperreality, fully committing to a detailed vision of “how things were”. 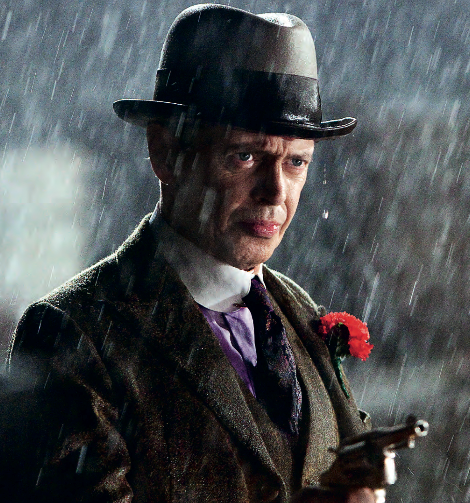 The focus in the first three seasons is not only organized crime in Atlantic City before the Great Depression, but also the Mafia’s relationship to American politics—and specifically to former political boss Enoch “Nucky” Thompson, played masterfully by Steve Buscemi and based on the historical figure Enoch L. Johnson. The series follows Nucky’s relationships to various underworld types and state and federal government agencies, painting a broad picture of the interconnectedness of these spheres of influence, as driven by Prohibition and corruption. Without a bedrock of morality, every character not only appears flawed, but is also constantly sidestepping an existential abyss of human evil in the byzantine political-criminal network—from the self-castigating, ultra-Protestant FBI agent Nelson Van Alden (Michael Shannon) to Nucky’s former mistress Lucy Danziger (Paz de la Huerta). In Boardwalk Empire, everyone’s guilty and all webs are intertwined.